If variety is the spice of life, other voices are probably the most important spice of the blogosphere. With that in mind, look for the occasional "Publishing 2020 open mike night" as I encourage others in the community to post their opinions as guest bloggers. First up, Heather Johnson, and she's here to talk about one of her passions: baseball books. Jim Bouton’s Ball Four. 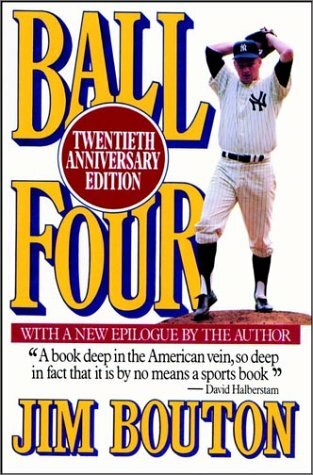 There have been many tell-alls to hit the bookstores over the years but Ball Four is the gold standard. Its greatness is not even just due to its recounting of Mickey Mantle's drinking day, rather, its true greatness emerges when we see how much the game meant to Bouton and how he'd do nearly anything to stay in the game for just one more turn on the mound. This is a must-read for any true fan of the game. Bill James' Bill James Historical Baseball Abstract. This is the Bible of books dedicated to the numbers of baseball. No other sport has a rich appreciation for statistics as baseball and Bill James is the authoritative figure in this realm. James ranks players at every position throughout the history of the major leagues and this is sure to spark a heated debate around your beach blanket. Jerrold Casway's Ed Delahanty in the Emerald Age of Baseball . This fascinating work chronicles the best hitter many people have never heard of and his contributions to the game. In the latter part of the 19th century, first generation Irish-Americans ruled the sport and brought a new, aggressive style of play to the game. Ed Delahanty was a tragic hero as his lifestyle contributed to a shorter career – a career that would have rivaled that of Babe Ruth. Bill Littlefield's Prospect. This popular NPR host shows his flair for the game in this wonderful, little novel that follows a prospect through the eyes of an incredulous scout. The scout feels as much pride as the prospect when he finally makes it to the big leagues. Jim Collins' The Last Best League. This production is a magnificent insight into the Cape Cod Baseball League in Massachusetts. The amateur summer league is considered the premiere league of its kind and Collins does a masterful job of portraying the game and the community in this effort. Heather Johnson is a freelance business, finance and credit writer, as well as a regular contributor for Business Credit Cards, a site for comparing business credit cards. She welcomes questions, comments, and freelancing job inquiries at her email address heatherjohnson2323@gmail.com. I'm the first to say, "HOW COULD YOU LEAVE OUT..."
How could you leave out "Wait Till Next Year" by Doris Kearns Goodwin? The ultimate valentine to her father, this is as much about baseball as it is about the bonds between parent and child. I've given copies of this not just to my dad, but to many and all have loved it. Hi Ellen. I think you mentioned this one to me before but I still haven't found the time to read it...sorry. But hey, it's not *my* list -- it's Heather's, my guest blogger! "Wait Till Next Year" sounds like a great book. I will have to put this on my list of books to read.